This short story made me want to read Firelight over again! 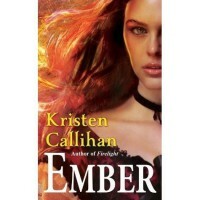 I read Firelight last month and it stayed fresh in my memory, but reading Ember has brought that book back to life for me. It was so good. Ember's time line take place between the prologue and chapter 1 of Firelight. While not necessary to read prior to Firelight, it will give readers a better understanding of how Miranda ended up in the situation she did, and explain how Archer has struggled with his curse and ailment. Ember also gives readers a deeper understanding of what connects Miranda and Archer, and you will learn more about her powers and why Archer is desperate to become whole once again. Some of these aspects did not get explained well until later in the book Firelight, but I still enjoyed it greatly. You may want to consider this before deciding which to read first, as there really isn't a must read order. I thought of Ember as a great 'deleted scenes' addition to the series, and just like a movie I find them most fun to watch after the movie and not before. In Ember, Archer and Miranda's story is told back and forth in snippets, so we see what both are doing while separated over a few years. (Pay attention to Archer's time line as most of it takes place two years later then Miranda's). The ebook did end at the 73% mark, and the rest of it was snippets from Firelight and the upcoming Moonlight. It was a great short read, not required to read Firelight, but still recommended if you enjoy that book. ETA: The page count for this book is approx 50-60 pages only, so if you really want to include it while reading Firelight it won't add too much to your reading. Since this story takes place after the prologue and before chapter 1 (during a three year separation), that may be the ideal time to read it. So you may want to know if Ember was a romance, and more so was it steamy? The answer is YES, and there is some good steam in this one for such a short story! I'm not going to spoil the 'how', but let me say it does help explain the deep connection between Miranda and Archer. Lastly, I can't end this review without commenting on the author. Kristen Callihan's writing is on a level you just don't see from most first time published authors. I love the story and characters she created, but it is how she brings them to life with her words that makes this series stand out. As I mentioned in my review of Firelight, I have no doubt this author will have many fans, and soon.